Description Ahobilam is one of the most venerated Vaishnava temples enshrining Narasimha. It is located near Nandyal in Andhra Pradesh. It is accessed from Cuddappah on the Chennai Mumbai railroad. Forty miles from Cuddapah is Allagedda, and there are bus routes to Ahobalam from Allagedda. Other possible routes, are Nandyal-Allagadda-Ahobalam and Dhone-Banganapalli-Koilakuntla-Ahobalam. It is referred to as the Nava Narasimha Kshetram, and is the seat of the Ahobila Mutt. Singavelkunram, praised in Tirumangai Alwar's decad of 10 verses in Tamil, is the Ahobila Divya Desam, enshrining as many as nine images of Narasimha - and is one of the two Divya Desams in Andhra Pradesh. The Puranas state thet the Nallamalai hills from Kurnool to Chittoor district are a personification of Adiseshan whose tail is Sree Sailam, middle is Ahobalam and head is Tirumala. Deities: This Nava Narasimha Kshetram enshrines Ahobila Narasimhan, Varaha Narasimhan, Malola Narasimhan, Yogananda Narasimhan, Bhavana Narasimhan, Kaarancha Narasimhan, Chakra Vada Narasimhan, Bhargava Narasimhan and Jwala Narasimhan. In the temple at the foothills, the Moolavar Prahladavaradan in a seated posture facing east; there are festival images of 8 of the Narasimhas, other than malola Narasimha. The festival image of Malola Narasimha is located in the Ahobila Mutt. 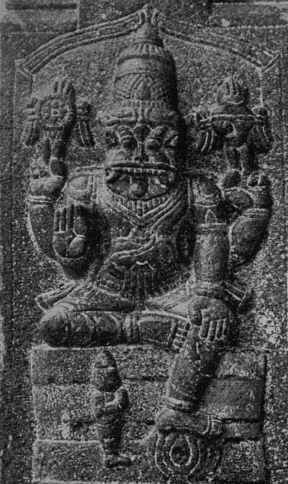 The Moolavar in the Ahobila Mutt is Lakshmi Narasimha, while the utsavar is Rama. Upper Ahobalam is 2800 feet above sea level.It is an arduous trek to upper Ahobilam from the foothills. The Lakshmi Narasimhar temple at the lower level, has mandapams, with remnants of fine sculpture from the Vijayanagar period. Upper Ahobilam enshrines Ahobila Narasimhan and Ugra Narasimhan. The moolavar images were the only shrines of worship during the period of the Chalukyan king Vikramaketu, while it was during the period of Prataparudra that festival images were made. Krishna Devarayar is known to have made endowments here. The two crests of the hill are caled Vedadri and Garudadri, through which the Bhavanasini Thirtham flows. There is a pillar near the Ugra Narasimhar and the Guha Narasimhar shrine; said to be the pillar, facing which the demon Hiranyakasipu asked Prahlada to demonstrate the omnipresence of Vishnu. Legend has it that Rama, separated from Sita worshipped Lakshmi Narasimhar here. Legend has it that Garuda, desirous of seeing the Narasimha form of Vishnu worshipped him here, and that Vishnu manifested himself as nine forms of Narasimha. Mahalakshmi is believed to have reincarnated into a family of hunters as Senjulakshmi, and married Narasimhar here. This event is commemorated in the annual festival in the tamil month of Maasi, when the local tribe actively participates in the festivities.